[miau] The Jewel of the Arts Slots game is a popular game created by IGT consisting of 20 pay lines consisting of five reels and three rows of play. Players have an equal pay line arrangement to bet on and can control how many lines they want to bet on, as well as how much they want to bet. One of the symbols of play is a wild symbol represented by a lady in a red kimono, which gives the players a bonus if it shows up in a spin of the wheel. The bonus is the fact that it will act as a substitute for any other symbol and can help you to win the spin. For instance, if you get two of these bonuses anywhere on the spin it instantly lets the player win twice their total bet, making this an exciting option! Plus, if you get three of them, you also get to go to a bonus round with three extra spins. There is a also a scatter symbol that helps you match and win more lines. Another great thing about Jewel of the Arts is the music. It has a similar feel as a 1980s type of music synthesizer with a fast-paced drum track consisting of several oriental music sounds. There is also a mix of pipe music and strings, which gives it a lively beat that players enjoy a lot. The graphics of Jewel of the Arts is also quite special and looks like it was painted onto the reels. It is very colorful with orchards, peach blossoms, and other items that really get the player into the spirit of the game. In addition, the basic symbols used in the Jewel of the Arts game is J, Q, K and A, which are created in a Japanese calligraphy. There are also other symbols such as a bird made with origami, a beautiful fan that is very decorative and a Japanese warrior. 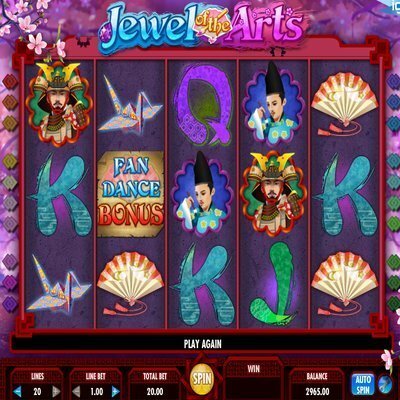 One of the tips for playing the Jewel of the Arts slots game is that you can reduce the number of pay lines and save your money if you merely want to try to get the bonus spins with the girl in the red kimono dress. Playing multiple pay lines will net you more profits if you hit on more than one line, but it all depends on how much money you are willing to lose if you don’t. The bonus spin feature works no matter how many or how few pay line are chosen. The bottom line is that the Jewel of the Arts slots game is a beautifully drawn game with great music and lots of opportunities to win a bonus round and get some extra spins overall.